Shaler Water PA | ProMinent Fluid Controls, Inc. Many public water utilities are rethinking the way chemical feed systems are designed and built. Effective solutions are being found in the use of engineered modular feed systems. Chemical feed is an area ripe with opportunities for water treatment plants to obtain significant performance gains. To achieve these gains, however, chemical feed systems must be designed and built to meet the specific needs of each application. Nowhere is this more necessary in a water treatment plant (and its distribution system) than in chlorine feed and booster chlorination operations. Custom engineered feed skids can often best facilitate the link between site-specific chlorination requirements and optimum liquid chlorine (sodium hypochlorite/NaOCl) feed and control system design. Fully Integrated Modular Systems “Packaged” feed skids have been around for a long time, but their use had been somewhat limited until relatively recently – due, in part, to few companies possessing the necessary expertise to provide reliable, fully integrated modular systems. Although many pump manufactures today provide package units, the resulting systems are often not designed with much understanding beyond the pump. Specialists, however, can add reliability to modular systems through the use of best practices engineering design for the site-specific application, which can include alarm capabilities, feed delivery confirmation, automatic switchover backups, redundant pumps and complete automation capabilities. For older treatment plants, especially, engineered modular systems can often provide the best answer for achieving compliance and performance gains. Many water plants are simply too old to make a complete overhaul of existing systems economical and/or physically feasible. Custom engineered feed systems, designed for the specific application, can typically provide abundant opportunities for gaining optimization, automation and safety at these older facilities. 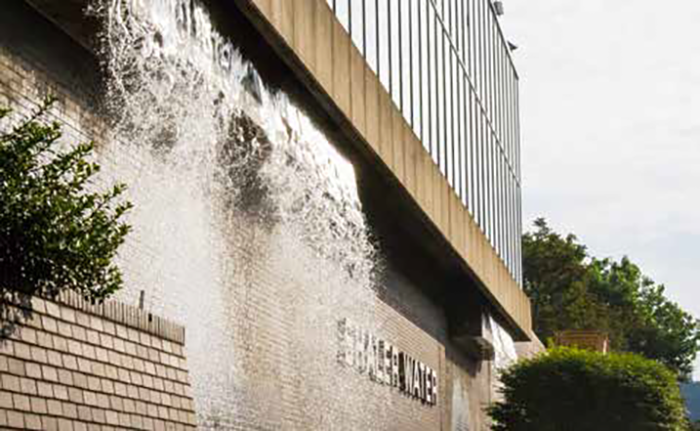 A good example of how incorporating engineered, “stand-alone” systems can bring results both impressive and sustained can be found at the Hampton Shaler Water Authority, just outside Pittsburgh. The authority was created as a result of a 2012 merger between the Shaler Water Department and the Hampton Township Municipal Authority. Just prior to the merger, the addition of custom- engineered feed skids at the 9 MGD Shaler Water Treatment Plant enabled a quick, effective switch from chlorine gas to NaOCl (commercial bleach) use for prechlorination, post chlorination and booster chlorination. Engineered modular feed systems provided the the necessary upgrades for a safe, efficient changeover in chlorination operations. The Hampton Shaler Water Authority (HSWA) supplies more than 1.3 billion gallons of drinking water annually to 25,000 customers of Shaler and Hampton Townships, Etna Borough and portions of seven additional townships. The authority produces more than 88 percent of its drinking water at its Shaler Water Treatment Plant. The plant draws from 14 wells located along the banks of the Allegheny River. The treatment facility is operated 24/7, has a rated capacity of 9 MGD and average production of between 4-6 MGD. Intake water is prechlorinated and, following filtration and softening processes, NaOCl is added to the finished water prior to entering HSWA’s distribution system. Like many older facilities, the treatment plant had long used gaseous chlorine for its pre- and post chlorination operations. The plant’s gas chlorination equipment and pressurized gas cylinders were removed from the site. In their place, five fully integrated package disinfection systems, designed and engineered by ProMinent Fluid Controls, Inc., were delivered and installed. 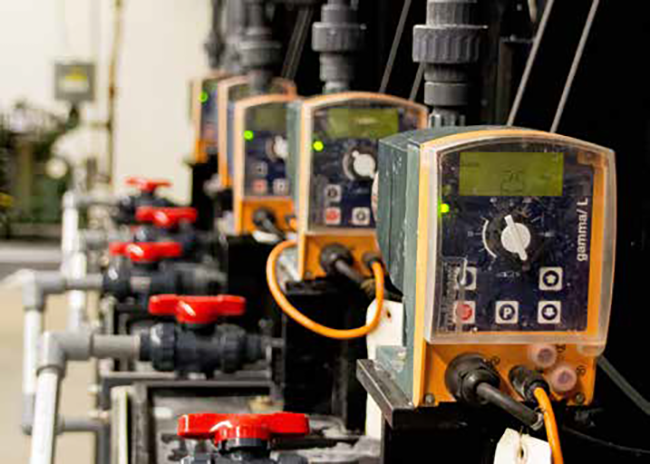 With the package systems, sensor technology, controllers and metering pumps form a unit that, along with the necessary storage tanks, were supplied to the authority as a “plug-andplay” solution. The customer-specific modular systems were tested by ProMinent and delivered to the plant on skids. For each feed skid, electricity was established and plumbing connected and interface connections made to the plant’s SCADA system. Each skid includes primary and backup pumps with capability for either pump or both to operate at the same time. For post chlorination, water leaves the plant with a 1.0 mg/L residual. 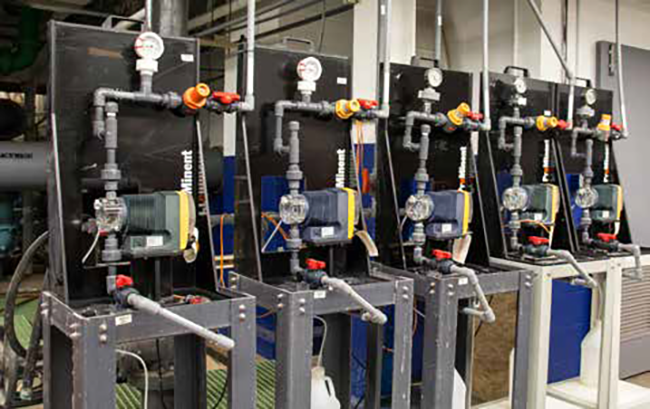 Serving all the engineered feed skids, chlorine residual analyzers take continuous readings and interface directly with the plant’s SCADA system. HSWA’s distribution system consists of approximately 314 miles of water main. Restoring bacterial control and maintaining adequate chlorine residual to all areas within the distribution system is paramount. The authority’s Felicity Avenue pumping station provides service to water entering the Hampton side of the system. “Our two chemical feed skids there at the station turn on automatically when the pump station is running” Urso says. “Residual chlorination for our booster chlorination is set at 1.0 mg/L.” Two 35-gallon NaOCl holding tanks serve those units. The Metering Pump With any chemical metering system, the heart of the system is its pump. ProMinent Gamma/L calibrateable pumps are integral to the HSWA’s chemical feed skids. The microprocessor- controlled metering pumps have builtin microprocessors that provide for electronic variable speed control. Also integrated into the pump is its autodegassing liquid ends, making the pump especially suitable for dosing off-gassing chemicals, such as bleach. Offgassing occurs when a pocket of vapor forms in the fluid lines and obstructs normal flow. This can air-bind chemical metering pumps, making them lose prime – which often means insufficient chlorine residuals being maintained. A special bleed valve integral to the pump’s liquid end minimizes potential for off-gassing issues. Urso says the plant has experienced no no issues with air-bound metering pumps. In addition, the pump’s integral bleed valve eliminates potential for priming issues. Simple calibration allows the pump to display flow rate and totalized flow, as well as flow monitoring for feed verification. The pump’s stroke length is infinitely adjustable, set digitally and is shown in the LCD display. Also, two pumps can be actuated differently by means of the same standard signal. Increasingly stringent environmental requirements, growing awareness of the effects of chlorine on the environment, and greater need for process optimization and safety are upping the demand for consistently precise chlorine feed and dosage control. Hampton Shaler Water Authority, like many public water authorities, have switched from chlorine gas to sodium hypochlorite. By specifying engineered feed skids designed specifically for this new, site-specific application, HSWA was able to accomplish this efficiently and costeffectively. Many public water utilities are rethinking the way chemical feed systems are designed and built. Effective solutions are being found in the adoption of modular chemical feed systems. Designed with the specific application in mind, a knowledgeable packaged solutions provider can offer efficiencies while providing fully integrated systems that bring reliable, performance-based chemical feed to critical applications.